With so many things happening all year long, it can be hard to decide when you should visit Walt Disney World. I’m going to break down the year by seasons and tell you the pros and cons of visiting during each of them to help you make your decision. 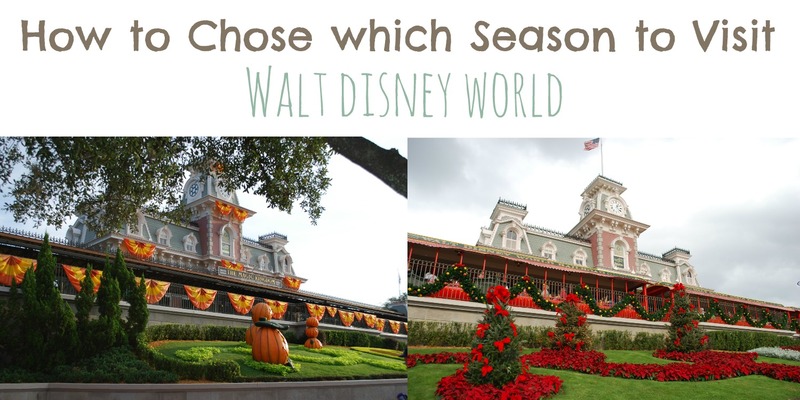 Then you’ll be able to decide which season to visit Walt Disney World and start planning your trip. Spring in Florida can be different than in other parts of the country. I’m going to reference March, April, and May when I tell you about the pros and cons for this season. EPCOT’s International Flower and Garden Festival – even if you’re not into flowers or gardening at all, it’s totally worth the visit. The topiaries and exhibits are breathtaking. They’re located all over EPCOT in both Future World and World Showcase. Less Crowds – if you visit in early spring, crowds can tend to be lighter, which is a great thing! Temperatures – in the words of my son “it’s not blazing hot”. Evenings still might be chilly but it’s nice and warm during the day. Spring Break Crowds – if you’re planning your trip during the spring break window (mid-March to mid-April), be prepared for higher crowd levels. Longer Park Hours – longer days means longer park hours. If you’re up for the challenge, you can spend 15 hours in the Magic Kingdom for the price of a one day ticket. Afternoon Rain Showers – when it’s hot and humid, that can make the perfect conditions for a nice little rain shower. Never fear – you don’t need to miss out on park time. That’s the best time to visit the parks because most everyone else chooses to leave so you might find shorter lines. Temperatures – it’s hot in Florida in the summer. Temperatures can easily be at or about 100 degrees which can make everyone more cranky and on edge than normal. Crowds – many families visit Walt Disney World while their kids are out of school on summer break so crowd levels are high. I’m making fall a little bit shorter while we’re talking about pros and cons and only including September and October. Halloween – one of my favorite special events that happens at Walt Disney World is Mickey’s Not So Scary Halloween Party. These parties require you to purchase an extra ticket but allow you to trick or treat in the Magic Kingdom with the other party goers. There are also special shows, merchandise, fireworks, and a parade just for the party. Cooler Temperatures – fall in Florida is still fairly warm, especially compared to other parts of the country. EPCOT’s International Food and Wine Festival – this is one of the best ways to try lots of new food from all over the world – even countries you don’t normally see represented in the World Showcase. There are concerts, cooking demonstrations, and plenty of new things to try. Shorter Park Hours – as the days get shorter, and crowds are lighter, park hours are shorter too. You can still have tons of fun in the parks, it just might require a bit more planning. Refurbishments – to lessen the guest impact as much as possible, Disney shuts down attractions when the crowds are lighter to update and repair different attractions. Winter’s probably the longest season in regards to Disney planning and includes November, December, January, and February. Christmas at Disney – if you’re not able to be at Disney on December 25, that’s ok! You can celebrate with Mickey’s Very Merry Christmas Party in November and December. It’s a special event held in the Magic Kingdom, complete with a parade, fireworks, hot chocolate, and cookies for the party goers. Holidays Around the World – each country in EPCOT celebrates the way they would in the actual country. This is a wonderful chance to see and experience celebrations from all over the world. Candlelight Processional – listening to the Christmas story told by a celebrity narrator is a very moving way to spend your afternoon at EPCOT. This is included in your park ticket so make sure you include it in your park plans. Decor – Disney goes over the top and the Christmas season is no exception. Christmas trees are found in all the theme parks and are larger than life. Storefronts have whimsical holiday displays. And if you don’t celebrate Christmas, don’t worry. Other holidays are represented in the decor as well. Meeting Santa – visiting Disney during Christmas means you’ll get to meet Santa and Mrs. Claus while you’re at Disney. Every Santa we’ve met at Disney has been spot on and exactly what you’d expect from a Disney Santa. Ringing in the New Year – Disney celebrates New Year’s Eve with special fireworks at Magic Kingdom. Temperatures – believe it or not, it gets cold in Florida! Make sure to check the forecast and prepare for chilly temperatures. It might still be warmer than where you’re from, but you’ll still get chilly. Pop Warner – each year ESPN Wide World of Sports hosts a super bowl for young football players and a championship for cheer and dance athletes. This is an amazing opportunity for these athletes but it can add a lot of extra guests to the resorts and parks. Shorter Hours – just like in fall, during times when there are lighter crowds, park hours will be shorter. Disney does a great job accommodating during the peak holiday season when crowds are higher. Refurbishments – again, just like in the fall, when the crowds are lighter during the winter season, attractions are closed down to be repaired and updated. Maximum Capacity – during extra busy weeks like Thanksgiving, Christmas, and New Years, parks can stop allowing guests to enter the parks because they’ve reached capacity. If you’re traveling during this time, you need to make sure you get to the parks early and plan on staying all day.